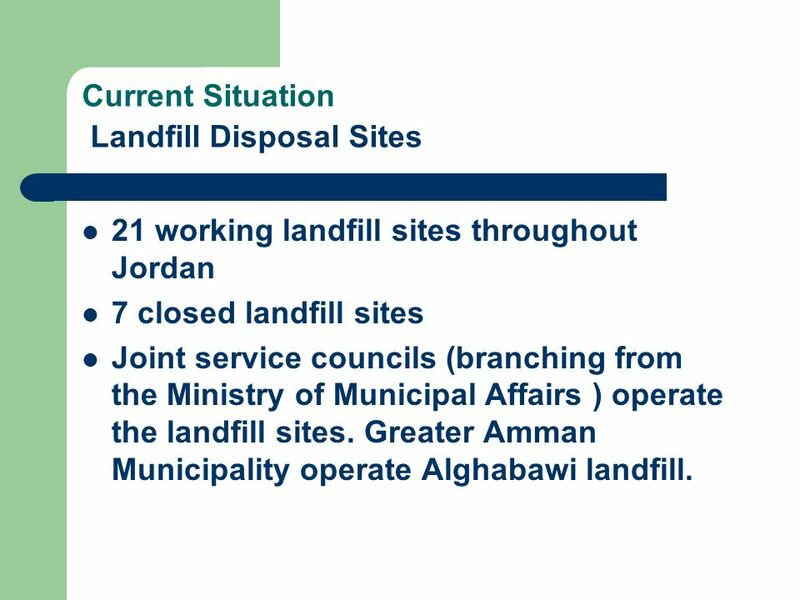 21 working landfill sites throughout Jordan 7 closed landfill sites Joint service councils (branching from the Ministry of Municipal Affairs ) operate the landfill sites. 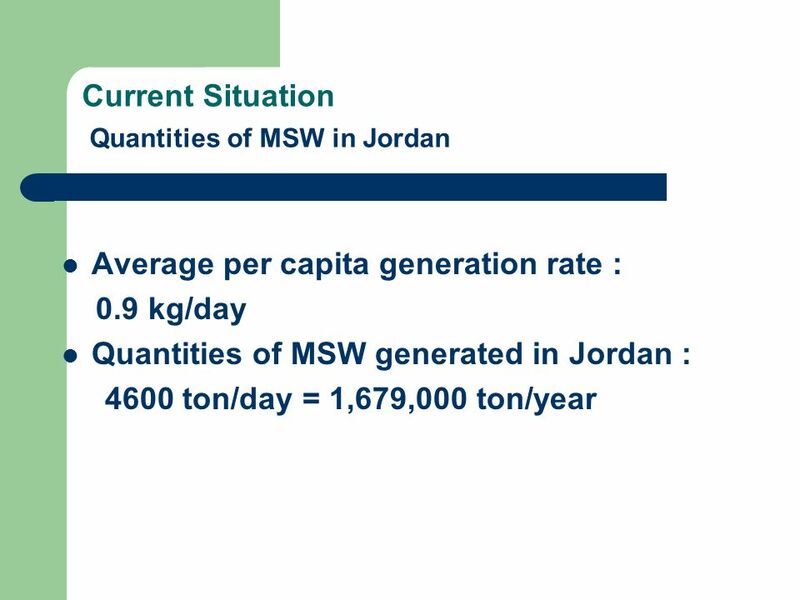 Greater Amman Municipality operate Alghabawi landfill. 13 Challenges…. Weaknesses in the existing legislations. Improper location of some landfill sites (may influence groundwater quality). Lack of new landfill sitting criteria. 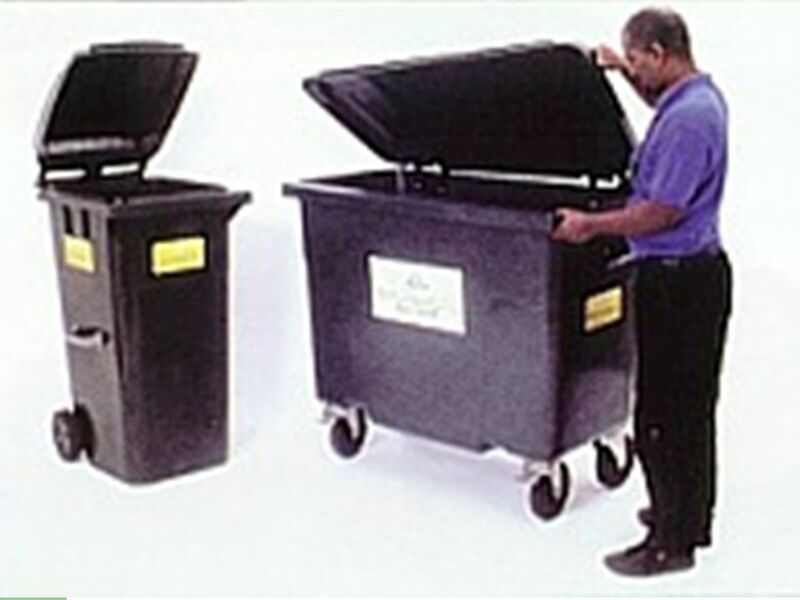 No lining is applied to landfills and no studies were conducted to prove the necessity of lining. 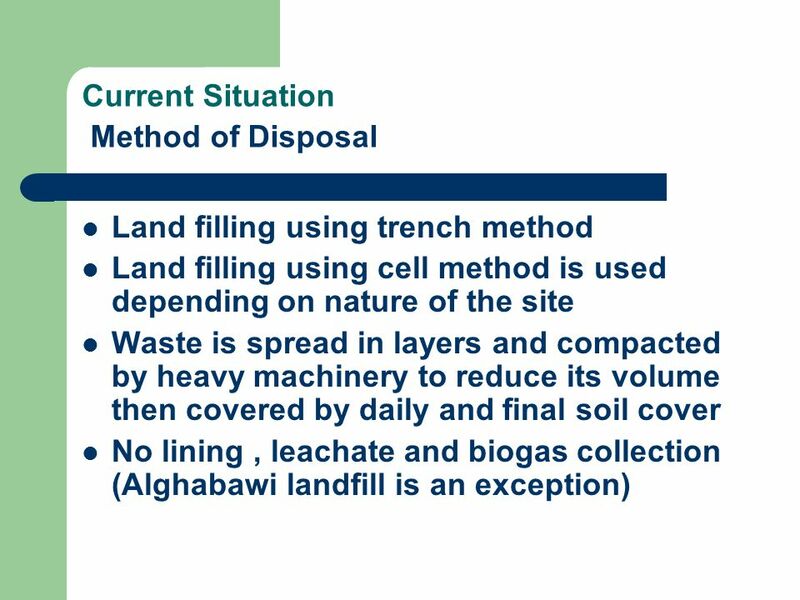 (Al Ghabawi landfill site is an exception). 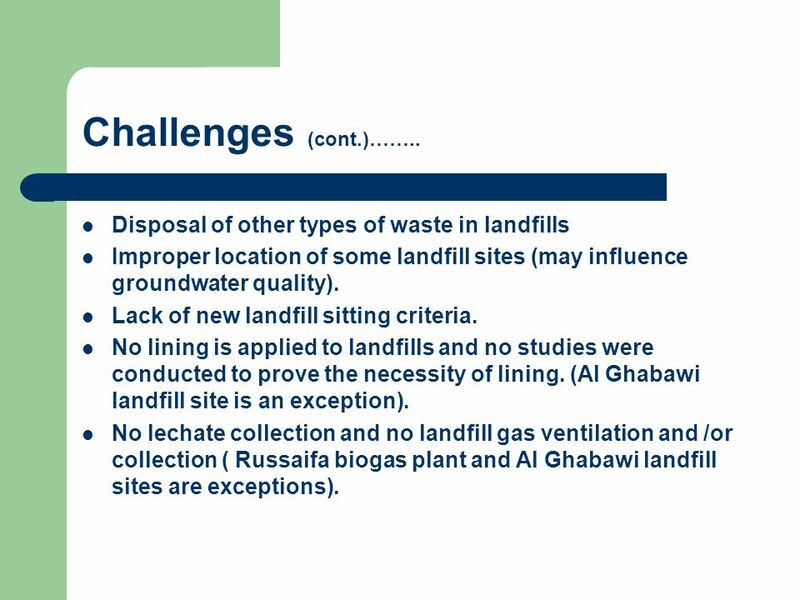 No lechate collection and no landfill gas ventilation and /or collection ( Russaifa biogas plant and Al Ghabawi landfill sites are exceptions). 15 Challenges (cont.)…….. 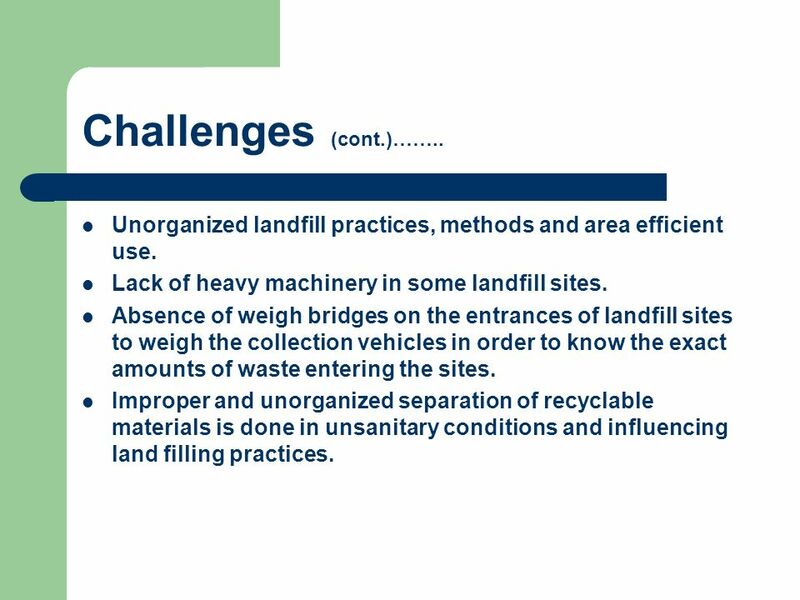 Unorganized landfill practices, methods and area efficient use. Lack of heavy machinery in some landfill sites. 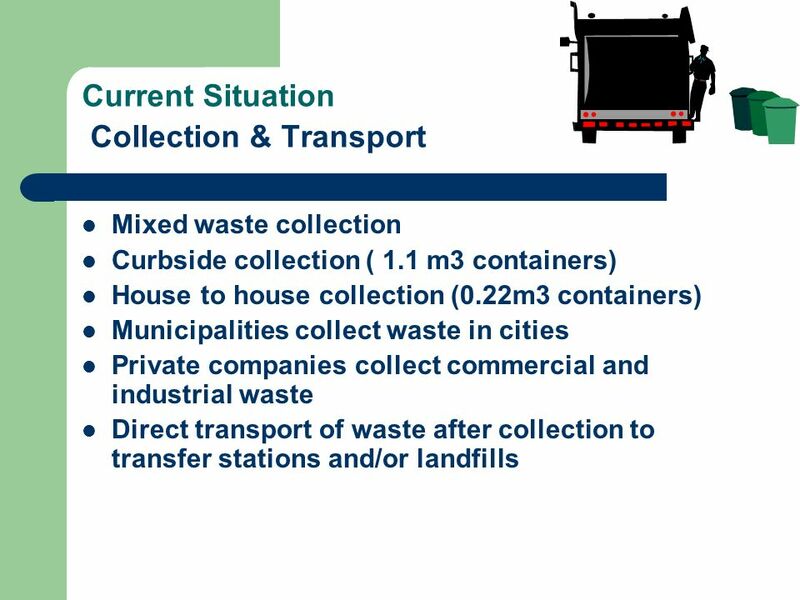 Absence of weigh bridges on the entrances of landfill sites to weigh the collection vehicles in order to know the exact amounts of waste entering the sites. 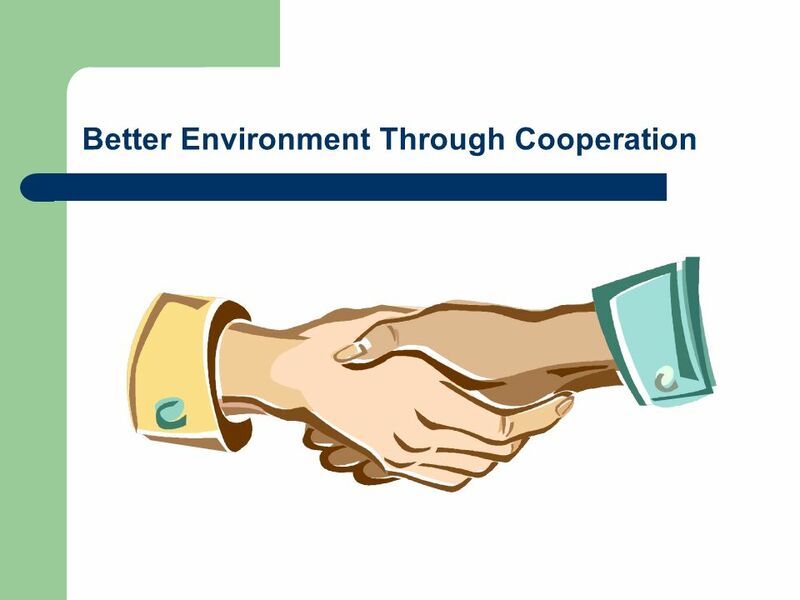 Improper and unorganized separation of recyclable materials is done in unsanitary conditions and influencing land filling practices. 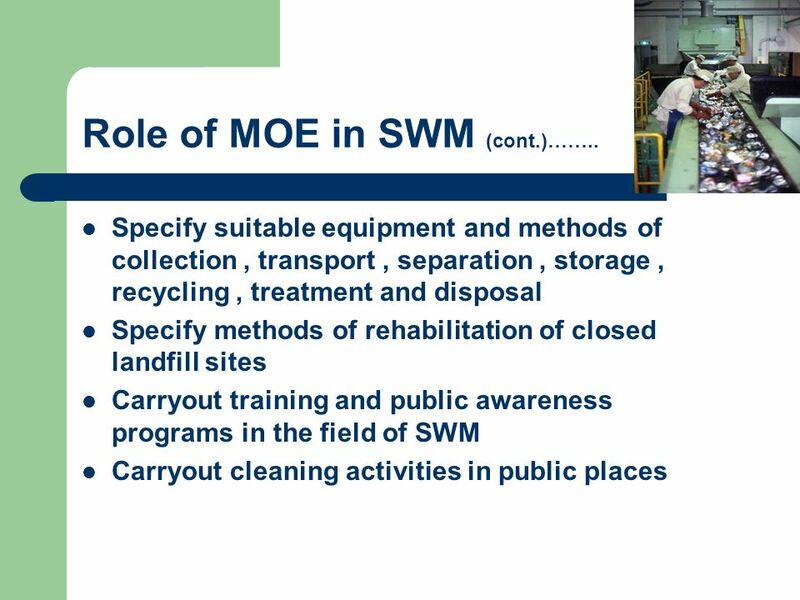 17 Role of MOE in SWM (cont.)…….. 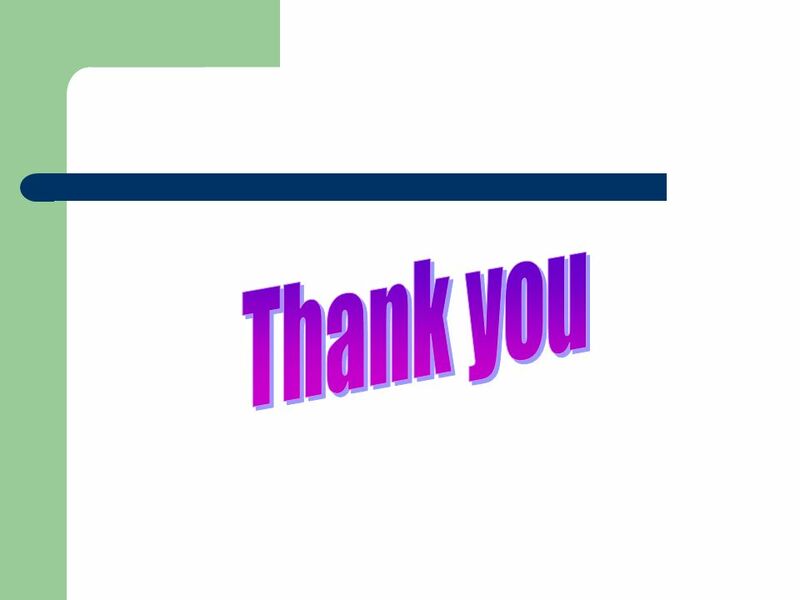 18 Progress so far (MOE) …. 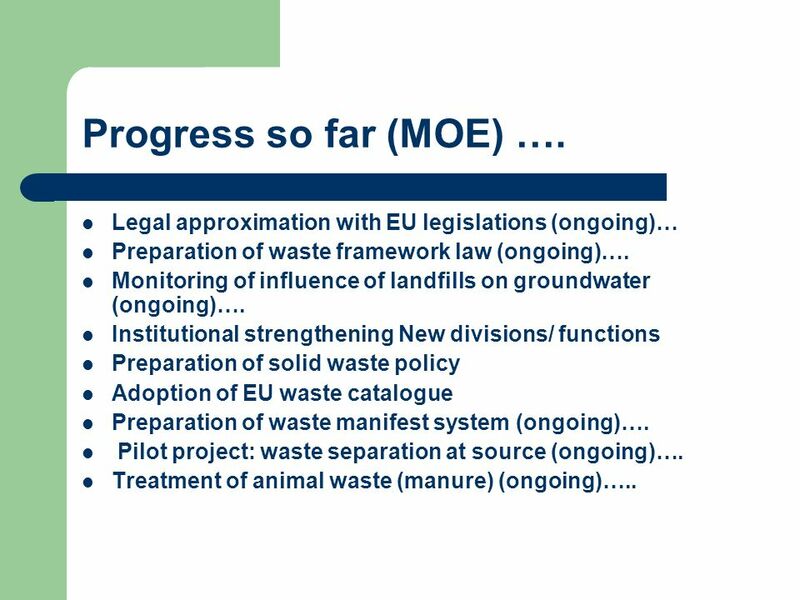 Legal approximation with EU legislations (ongoing)… Preparation of waste framework law (ongoing)…. Monitoring of influence of landfills on groundwater (ongoing)…. 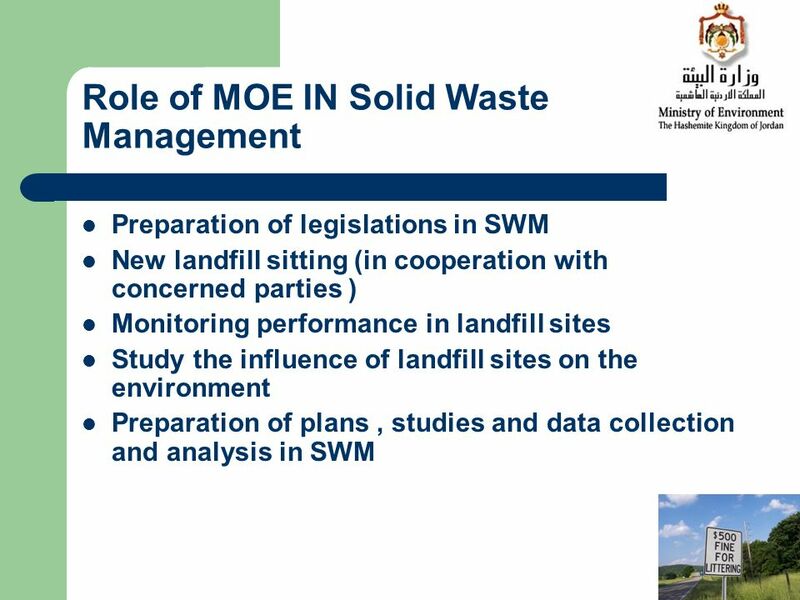 Institutional strengthening New divisions/ functions Preparation of solid waste policy Adoption of EU waste catalogue Preparation of waste manifest system (ongoing)…. 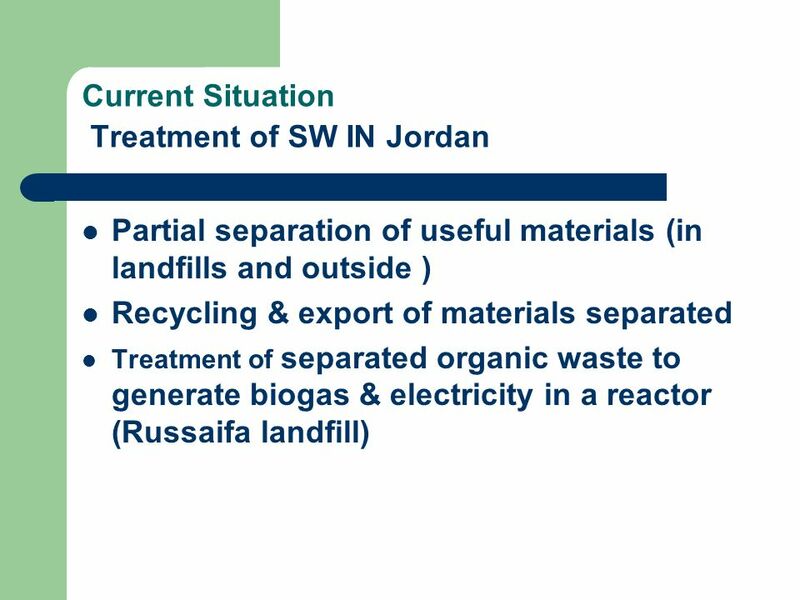 Pilot project: waste separation at source (ongoing)…. 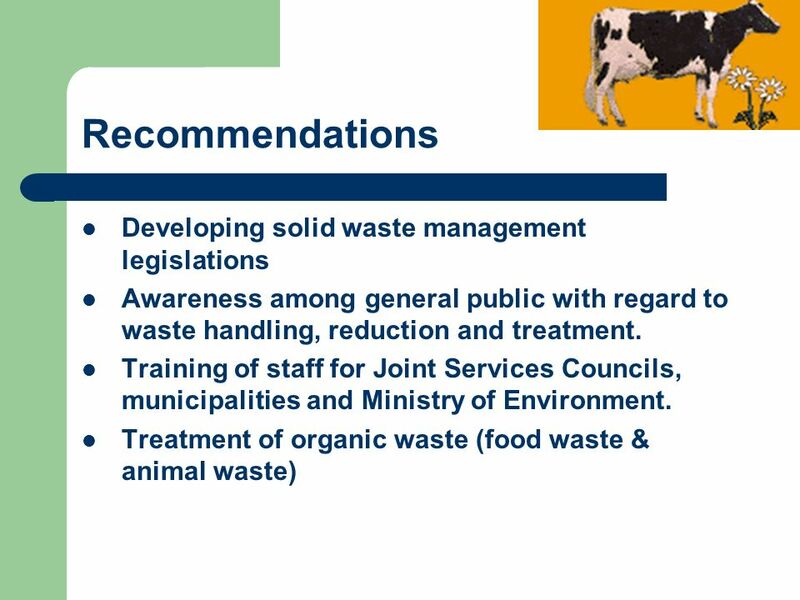 Treatment of animal waste (manure) (ongoing)….. 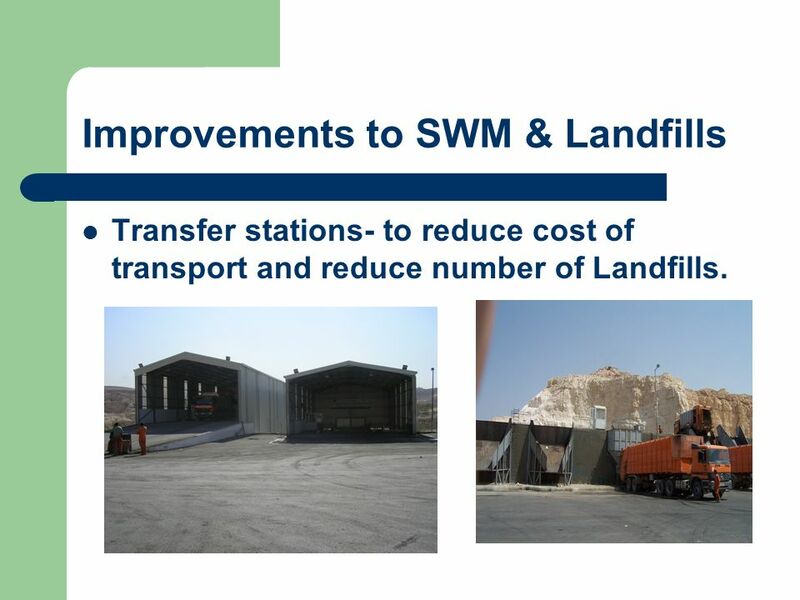 Transfer stations- to reduce cost of transport and reduce number of Landfills. 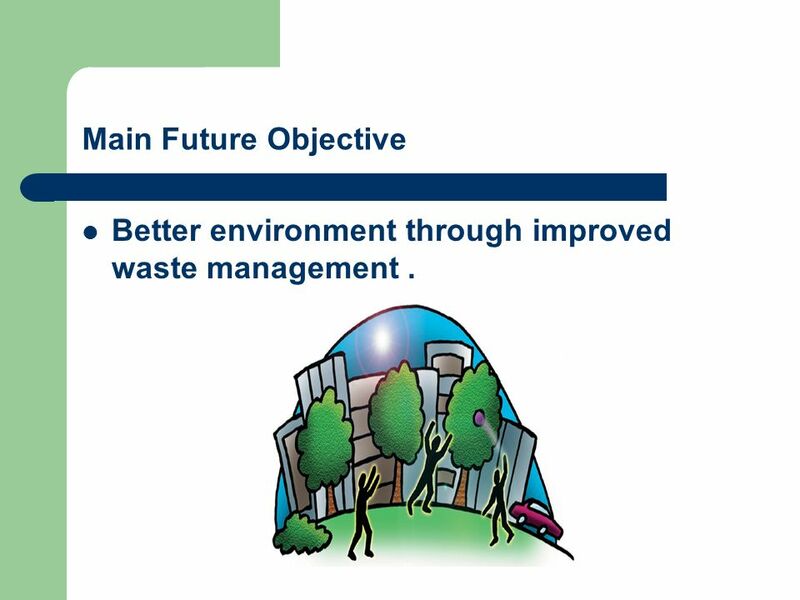 22 Main Future Objective Better environment through improved waste management . 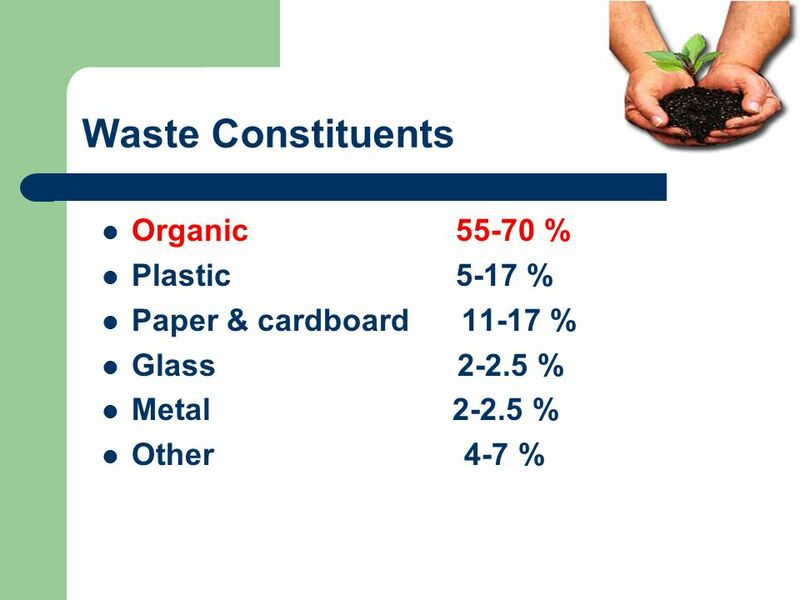 Waste separation and treatment of organic and no organic portions. Waste reduction. 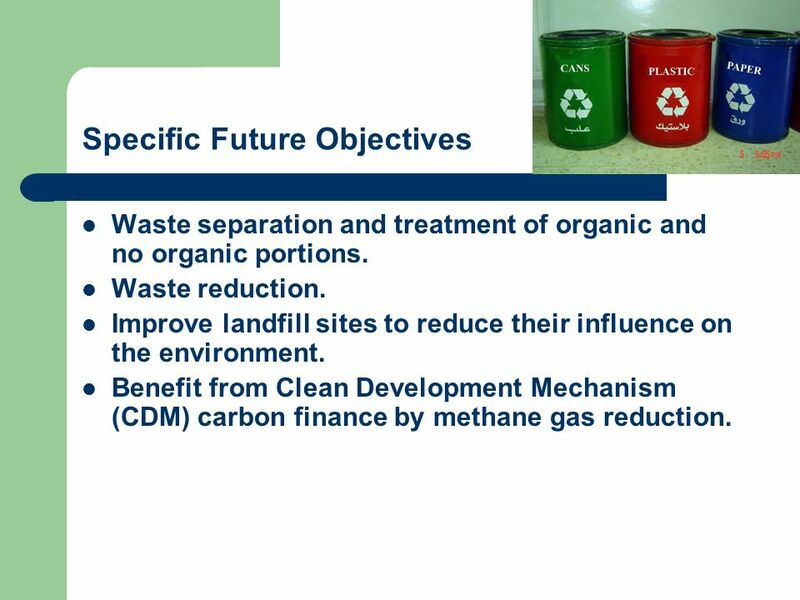 Improve landfill sites to reduce their influence on the environment. Benefit from Clean Development Mechanism (CDM) carbon finance by methane gas reduction. 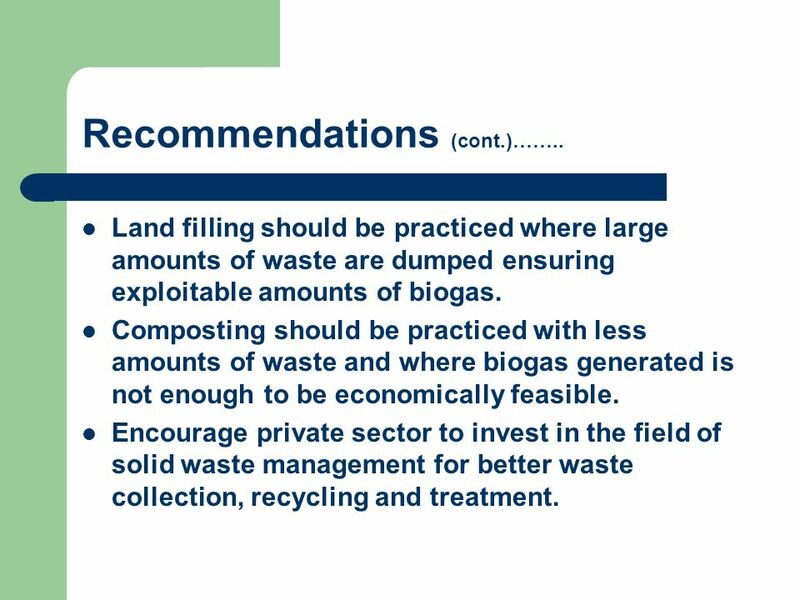 Land filling should be practiced where large amounts of waste are dumped ensuring exploitable amounts of biogas. Composting should be practiced with less amounts of waste and where biogas generated is not enough to be economically feasible. 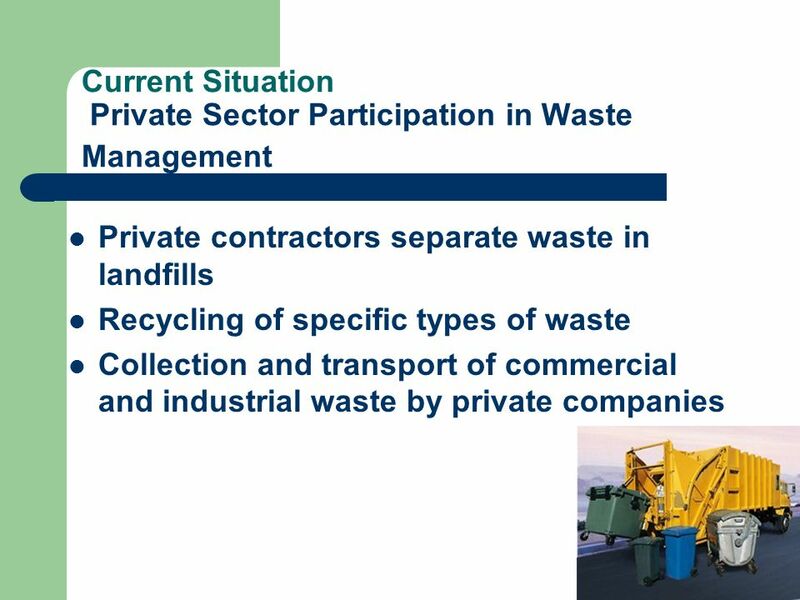 Encourage private sector to invest in the field of solid waste management for better waste collection, recycling and treatment. 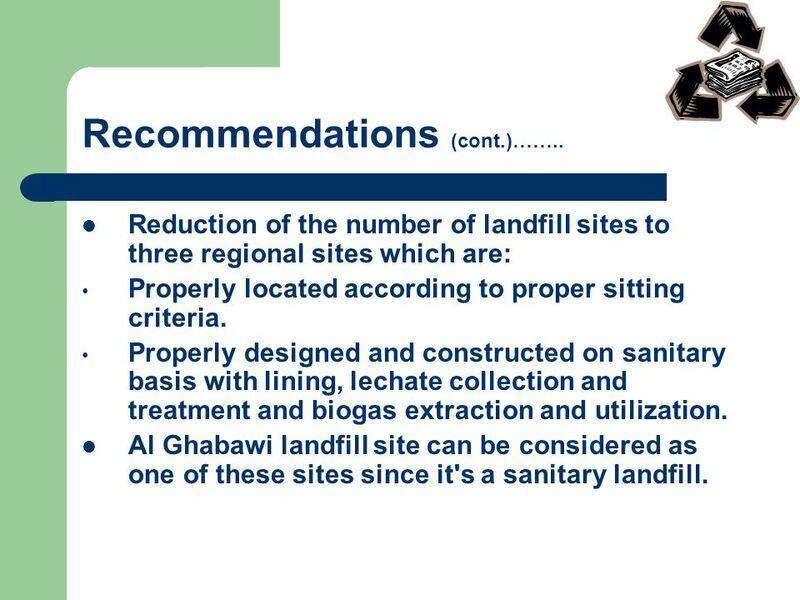 Reduction of the number of landfill sites to three regional sites which are: Properly located according to proper sitting criteria. Properly designed and constructed on sanitary basis with lining, lechate collection and treatment and biogas extraction and utilization. 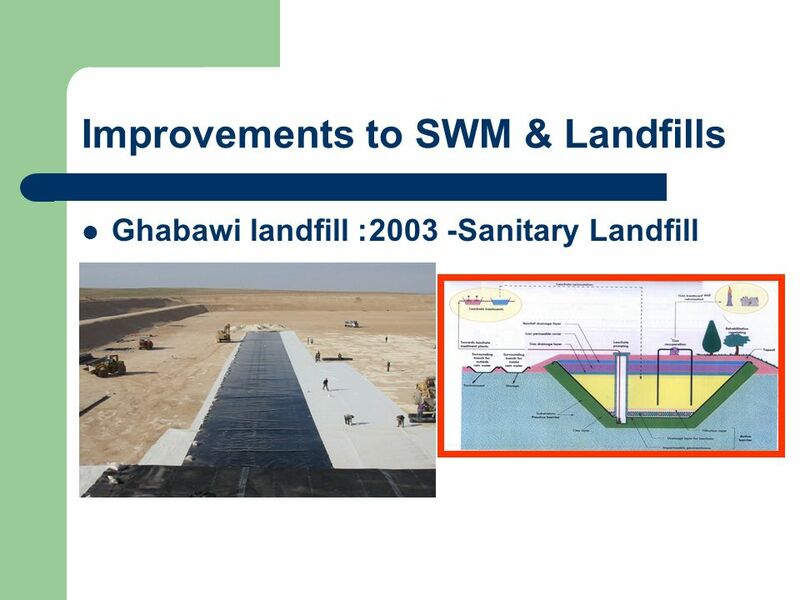 Al Ghabawi landfill site can be considered as one of these sites since it's a sanitary landfill. Transfer stations should be properly located and well managed. 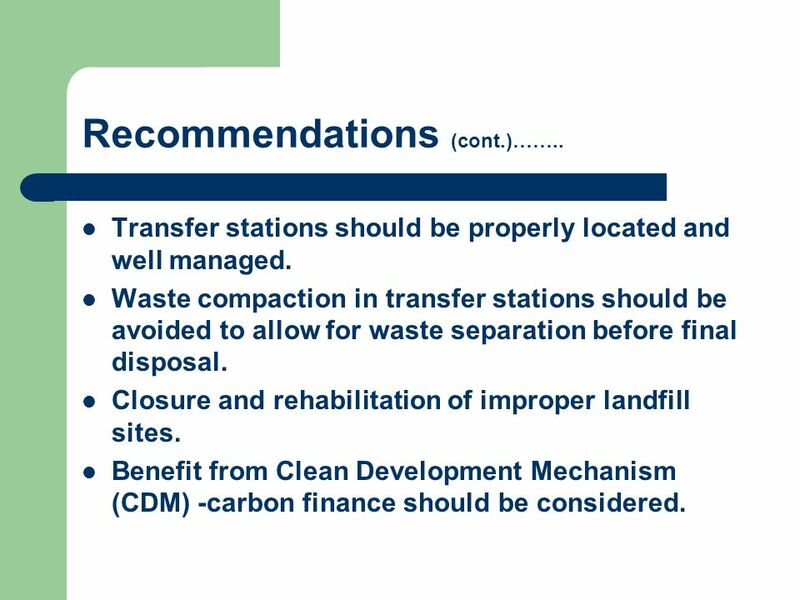 Waste compaction in transfer stations should be avoided to allow for waste separation before final disposal. 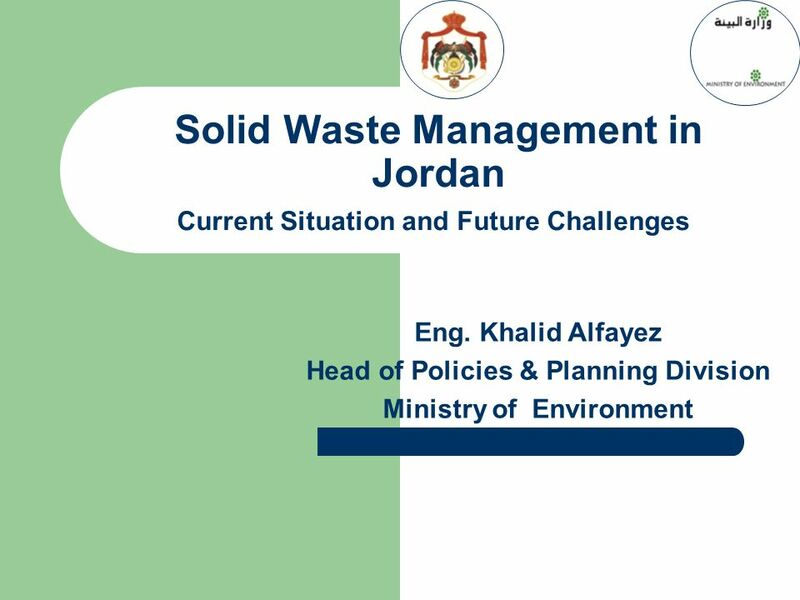 Closure and rehabilitation of improper landfill sites. Benefit from Clean Development Mechanism (CDM) -carbon finance should be considered. Download ppt "Head of Policies & Planning Division Ministry of Environment"
Environment in Lebanon: Status and Way Forward Ricardo Khoury Environmental Consultant, ELARD City Café – Beirut, Lebanon April 5, 2007. 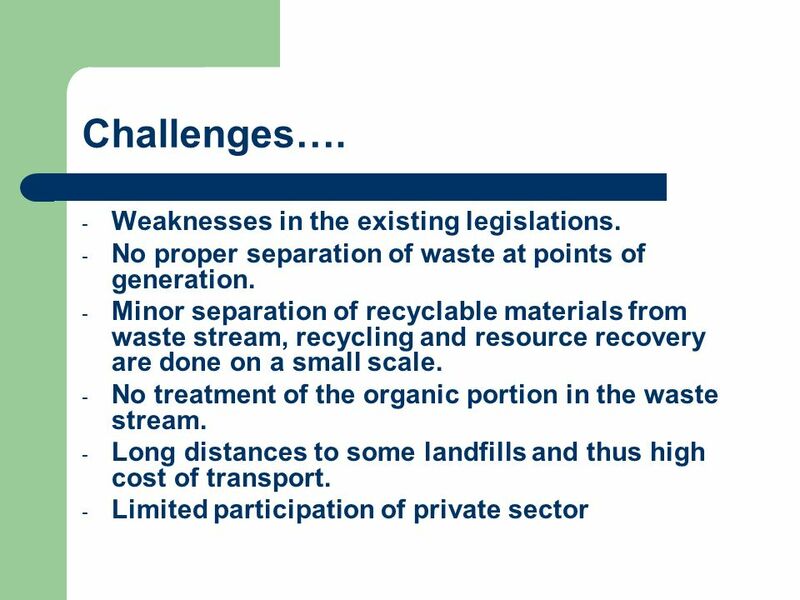 Facts, trends and challenges in waste management in the Republic of Macedonia M.Sc. Margareta Cvetkovska, Ministry of Environment and Physical Planning. Recycling experiences in the Republic of Macedonia M.Sc. Margareta Cvetkovska, advisor Ministry of Environment and Physical Planning. 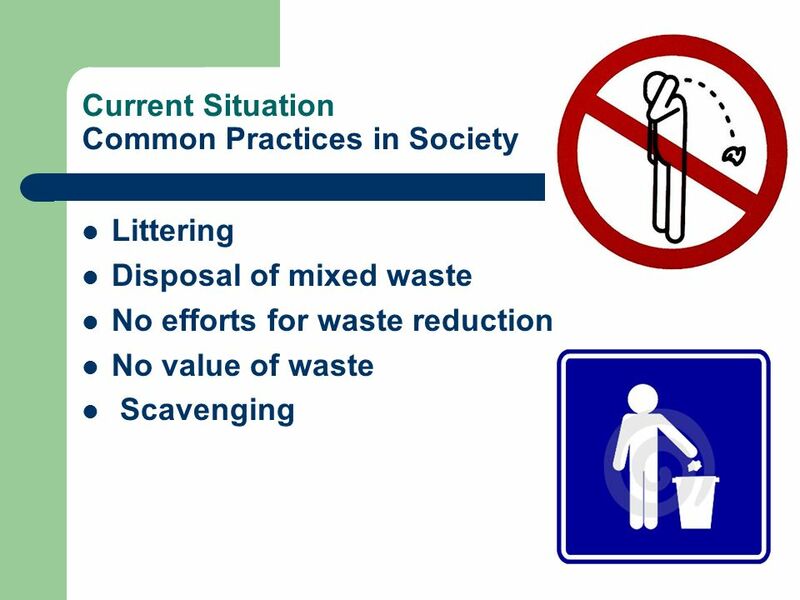 Solid Domestic Waste IB Syllabus 5.5.1, AP Syllabus Ch 21 Personal Waste Audit Trashed video. 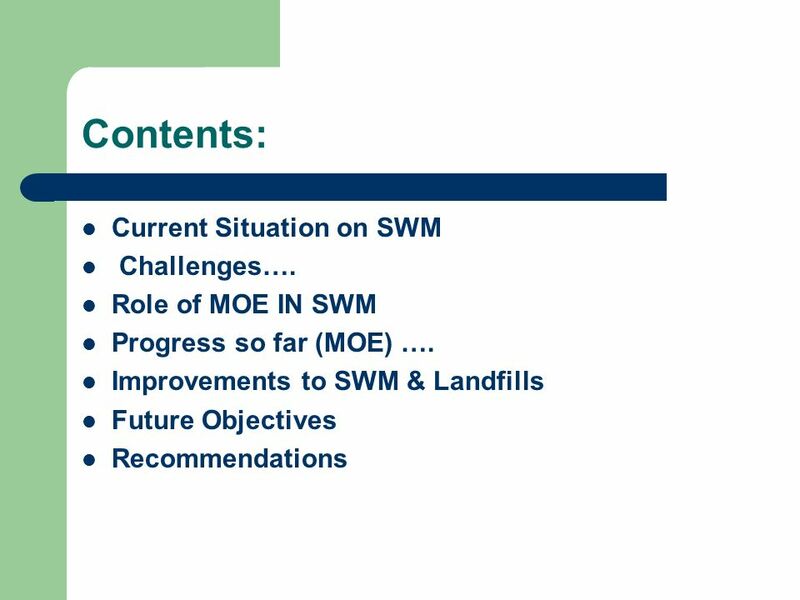 Sustainable Landfills: The Future of Land Disposal of Municipal Solid Waste (MSW) Patrick Hettiaratchi Associate Professor, Department of Civil Engineering. 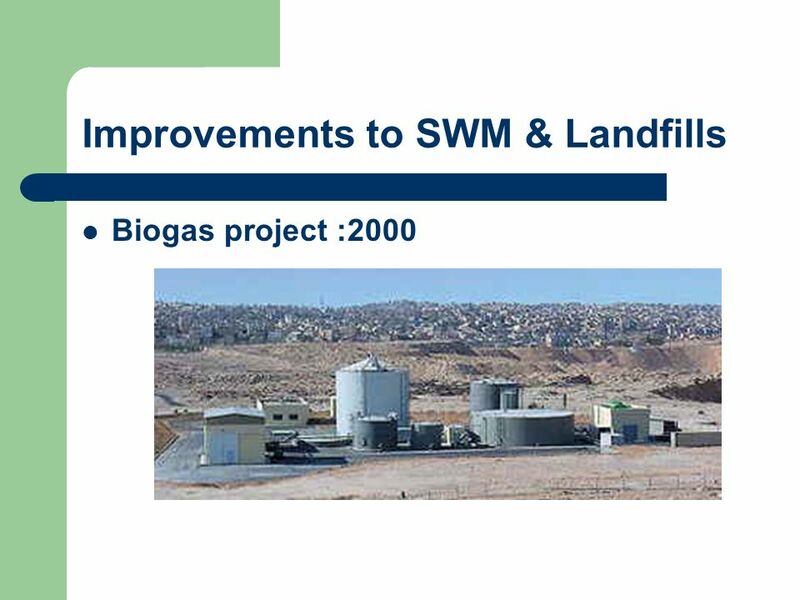 NATIONAL SOLID WASTE MANAGEMENT PROGRAMME RIVERTON LANDFILL. 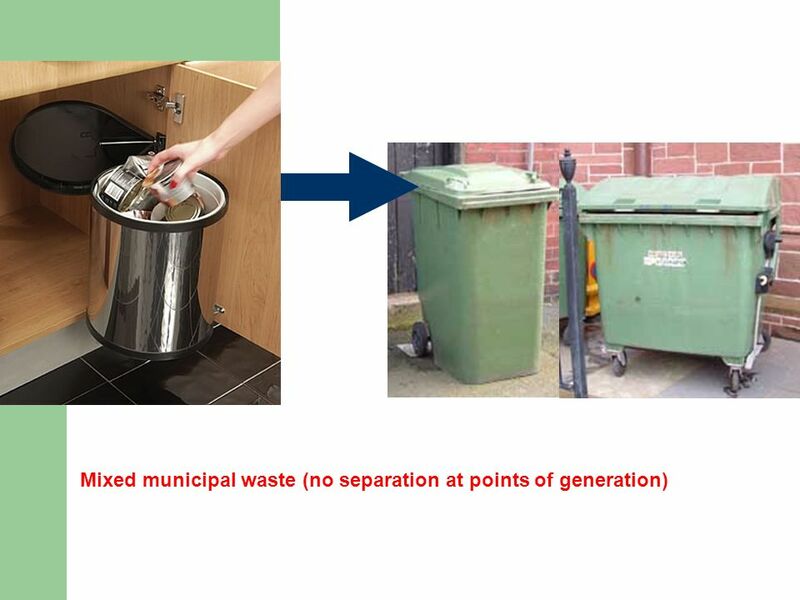 INTEGRATED PLANNING: THE LINKS BETWEEN URBAN WASTE MANAGEMENT, SANITATION AND ENERGY.